The network in the Middlebury and University Park neighborhoods is rich with resources! As we continue to learn about neighborhood resources and assets, we will add them to this page. The following asset map visually highlights some of the resources in our community. Click on the legend (the box with the arrow in the top left of the map) to filter the resources into categories or click on a point on the map to learn more about that resource. Click on one of the sections below to learn more about the resources available in your neighborhood! Be sure to check out InfoLine at their website or by calling 211 for more information on transportation resources. 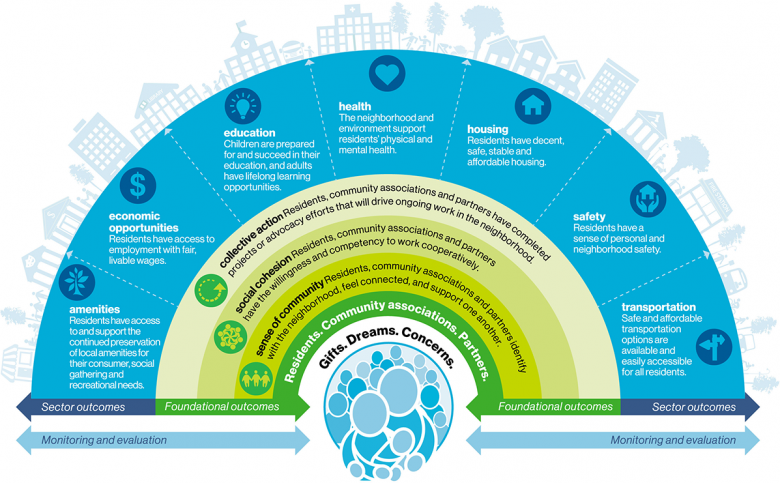 Neighborhood Network builds foundational outcomes by partnering with and working alongside residents, community associations, and partners in the neighborhood. This entails seeking to understand different perspectives and aspirations; bringing people together to find opportunities to engage neighbors; formulating a comprehensive plan with all stakeholders that tackles common goals; and then implementing and taking collective action on this plan. By taking these steps, sustainable and systematic change in the neighborhood can be achieved. To join this effort, make sure to attend a Neighborhood Network Monthly Meeting. If you know of an agency, company or individual that should be included on this resource page or the map, please contact marissaL@hfhsummitcounty.org to have them added.